Coming to Des Plaines with Our ‘Hearts’ on Our Sleeves! Look out Des Plaines, Wagging Hearts is coming to town on Saturday, November 16th from Noon to 4 p.m. with our ‘Hearts’ on our sleeves looking for some forever love with some adorable adoptables. Come out and witness the beautiful personalities seeking a new home with joy in their eyes just to see YOU. Pop in to talk to us about fostering opportunities, adoptions, volunteering or support us through donations which can be dropped off during the event. We would love to meet you and thank you in person. Bring the family and consider going home with one of our ‘Hearts’, so deserving of a home to call their own. Perhaps drop by just to review our adoptables binder to see if one of our other adoptables in foster may be a better match and discuss with someone from Wagging Hearts in person. We can’t wait to see you there and will tell our ‘Hearts’ that some new friends and potentially forever families are on their way!! See you soon. Email questions to contactus@wagginghearts.org. Allie, Apollo, Athena, China (new pittie), Happy (new boxer), Hogan, Holly, Kiko (new shitz Tzu), Little Gracie, LuLu, Molly, Tessa (new pittie), Tilly, Vinny and pups (2 beagle mixes, 2 terrier pups). And more as they are announced. Looking for a Wagging Hearts event to attend? Look no further! Bookmark our Events page to stay up-to-date on our up-and-coming events!! 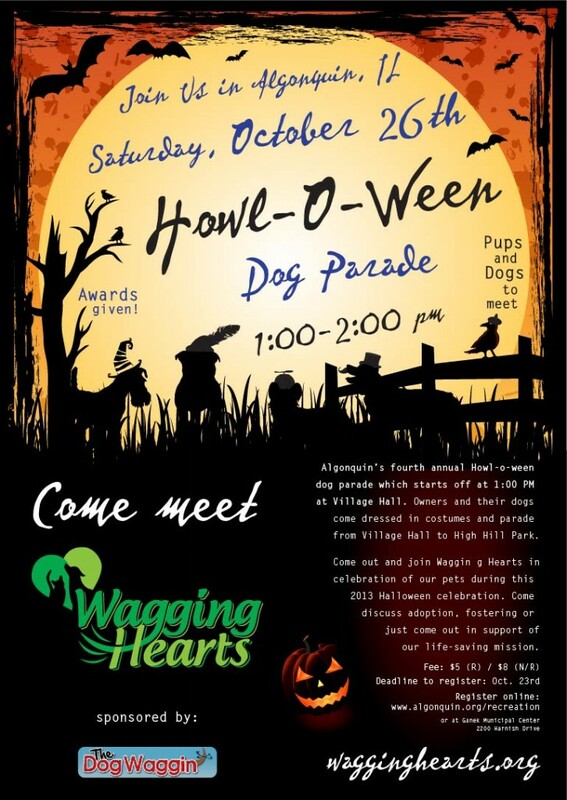 Come out in Halloween flair and costume-style this Saturday, October 26th from 1:00 to 2:00 PM in Algonquin, IL for the fourth annual Howl-O-Ween Dog Parade sponsored by The Dog Waggin. This kid-friendly and pet-driven dog parade starts off at 1:00 pm at the Algonquin Village Hall. 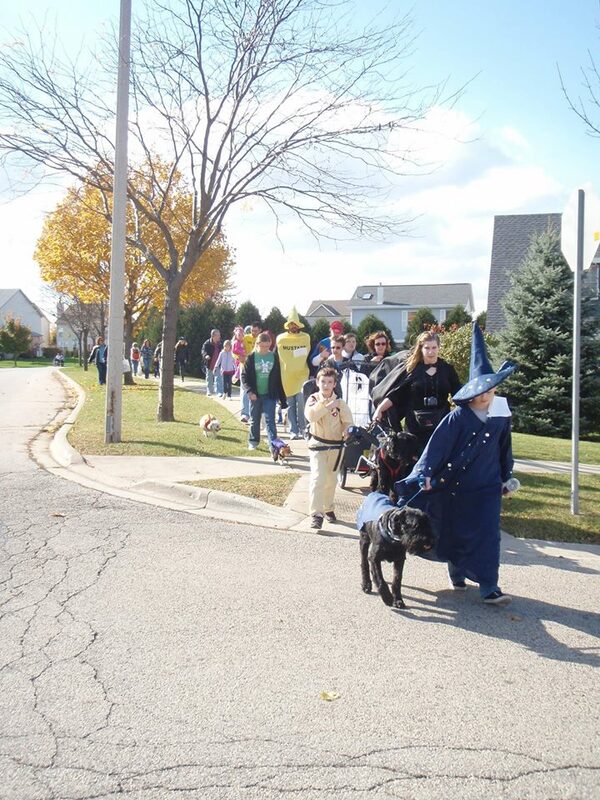 Owners and their dogs come dressed in costumes and parade from Village Hall to High Hill Park. Come out and join Wagging Hearts in celebration of our pets during this 2013 Halloween celebration. Join us to meet some of our adorable adoptables and share in some tender love if not for just a moment of time. While there please don’t hesitate to discuss adoption, fostering or how you may be able to support us with our life-saving mission of rescuing, caring and sharing the many lives we are able to save…with all of you. We love to meet those who share in our vision of providing a better future to so many in need. We look forward to seeing you there! Register online or at Ganek Municipal Center 2200 Harnish Drive. Have questions or inquiries, connect with us today! Share our flyer and invite some others to join!! Our next ADOPTION EVENT at Petco in Round Lake Beach, IL is on Saturday, October 5th, from 11 a.m. to 4 p.m. Then again on Sunday, October 6th, from 11 a.m. to 3 p.m. We will have many of our wonderful adoptables onsite to make a love connection. Consider filling out an adoption application ahead of time!! Learn more about the positive impact of opening your home to a foster pet while they wait for forever love. We have several beautiful rescues waiting in boarding for a foster home to open up. Inquire today and fill out a foster application ahead of time!! Have some donation items? Bring them by and stop to say hello. Grab a kiss or two from one of our adorable adoptables. Talk to us about volunteer opportunities or just to catch up on your adopted alumnist. We can’t wait to see you there!! SATURDAY, October 5th, 2013: Beacon, Big Boy, Blue, Chester, Clyde, Ditka, Emilia (new arrival), Fiona, Goliath, Hannah, JoJo, Latte, Lexi, Lillia, Lucy, Maggie, Nala, Parker, Payton, Peepers, Queenie, Sabrina (new arrival), Tigger, Zippy and lastly our new lab puppies arrivals. SUNDAY, October 6th, 2013: Same but subject to change. Please connect with us at contactus@wagginghearts.org if you would like to check on the status of an adoptable to check on a meet and greet potential. Visit our Facebook Adoptopn Event album to become a part of the latest updates today! VOLUNTEER Opportunity:We are looking for some volunteers to assist as our event animal caregivers. We will be bringing rescues from boarding who need someone to look after them as well as some rescues in foster homes who will be at event without a handler so we are in need of some gentle hearts ready to provide a guiding hand. All that we ask is that you walk and talk your rescue around giving them he best exposure to connect with forever love. Take them outside for crowd and potty breaks, provide water and loving reassurance. Watch out for them and insure they are properly cared for while in your hands during the event. Email volunteer@wagginghearts.org if you can share a few life-changing hours with our rescues. They seem to show a little better when they are not alone among the crowd and portray a more relaxed, calm and happy demeanor. Let’s help them shine, connect with us today! What A Unbelievable Event Filled With Dedication, Support and Love for the Animals! We could not be more thankful for all that attended this year’s Dog Days of Summer event. Our volunteers worked hard to provide fantastic, positive exposure for our adoptables. Many made real connections with the lives that Wagging Hearts saved along the way. Nothing is more powerful than to witness a life that was destined to fade away — tucked alone and abandoned in a shelter — find a family to love them, care for them. And to insure that they finally understand what forever really means. That is the goal for each of our events … get the word out. Rescue animals have so much to give but sometimes it is buried a little deeper inside them because of the journey that life has taken them on. But events like Dog Days of Summer, presented by Pampered Pupz, allow us to showcase these lives. To thrust them out into the light of day to present the unique and utterly beautiful personalities that each of them are. Small, medium and large breeds all looking to settle down and find that one home ready to provide all the permanent love and care they will ever need. What a journey we are all taking together for the rescued lives we are meeting along the way. They are all that really matters, right? We are humbled!! Our volunteers, fosters, boarding facilities, family, friends and new acquaintances came out in full support on Saturday and Sunday. Summer, our littlest volunteer walked the crowds with her cuteness alerting many to our donated gift basket raffles each day. Summer brought the masses to our booth and filled our donation jar with her young, gifted tenacity to work hard for the animals. What a rescuer in the making and how lucky we are to have her support!! Natalie, nothing stops her when it comes to putting it all out their for the rescues. She gives us all of herself; dedication of immense time, effort and a great, big heart. Care Animal Hospital in Libertyville, for transporting our rescues to and from your facility. Guess what … all of them found forever or foster homes. THANK YOU from the bottom of our hearts for your assistance. Such support provides ripples of assistance to our organization. Jenna (found forever love), Skyler (found foster love) and Thema (found forever love). All our volunteers who gave their all to us on both days. We watched you talking, showing off and loving our rescues. We saw lives being altered with each new connection. We watch young volunteers 8 years and up helping the animals stay cool and provide a lap to nap in when things got to be a bit too much. Our event was in simple words … amazing and successful. Lives have been altered and love has been shared. What more could we ask for — oh yeah … we did raise some good, old-fashioned money which goes directly to the care of the animals in our rescue. Tye (right) and Ichabon (left) welcomed everyone with their beauty and delightful squawks. Dog Days of Summer brought to all of us by Pampered Pupz. Wow! Kudos. Save-A-Pet corner of Cook’s Park, one of the featured sponsors of Dog Days of Summer. The rose bush garden trails lead to Cook’s Park. Ichabon amazing everyone with tricks. Tye and Ichabon grabbing the crowds attention with their stunning colors. Tonto (available for adoption) tasting some icy treats. A tender moment of sharing cool refreshing treats with Tonto and baby. Tonto and Wrigley and baby in forefront, just hanging out in the tent. Alyassa, smiling as she must know forever love was coming her way. Wendy (available for adoption) and just a complete snuggler with a great smile.. Lemon (available for adoption) and as beautiful as a slender gazalle. Dixie who found forever love could not look more content. Raffles (available for adoption) wonders if he will find his forever place in this big world. Gretchen smiling at her luck of the day to be going home with her new family. Gretchen hopes many others come for her foster sisters and brothers still waiting for adoption. Connect with us if you can assist with adoptions, fostering or just through supporting our organization. Thank you as always for the phenomenal support given. What a great event on the day that our country celebrates its’ Independence Day and what an honor to walk in such a historical event in Evanston as it celebrated a 150-years of Independence. We walked in this parade with a new sense of freedom as we began to acknowledge what this day meant to the lives we saved. Each one should not of been at this parade. Each one had no time left, no where to go and no one left to care. But then a new future opened up when Wagging Hearts became involved. Lives were saved, one-by-one with the combined help of our foster community, volunteers and supporters who allow us to provide them with a new future. A few lives now have a new sense of independence, on a new road to freedom. This parade provided an opportunity to walk in the sunshine while looking for a new forever family amongst the many who gathered along Central Street. The colors, sounds and movements were a sight to behold as the procession moved along to the beat of the day! Watching all the participating floats and organizations who brought their talent and energy to such a bright, beautiful day. The crowd was loud, happy and dedicated to whooping it up for a little puppy love and entertainment! 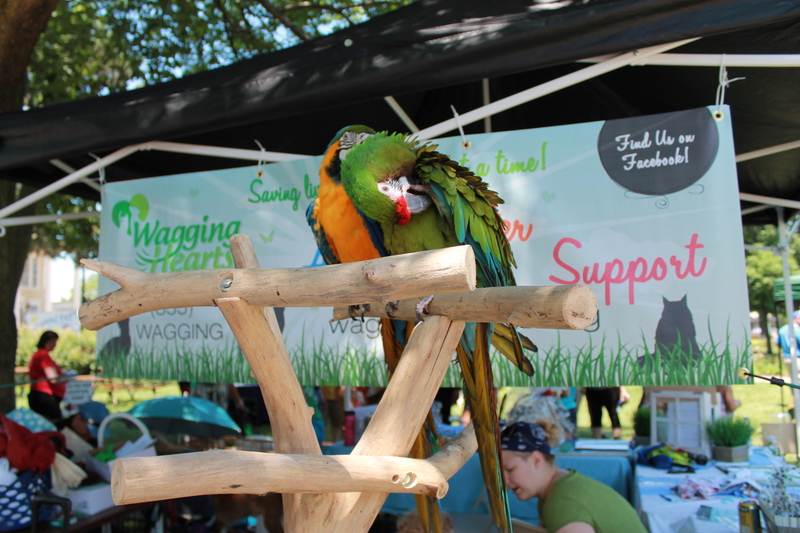 Wagging Hearts brought a sea of green in the form of our volunteers, fosters, adopters and board members. Two-legged and four-legged alike. The many dogs that walked are available for adoption. We could not have been prouder, or walked taller, next to the dedicated hearts that came out to help walk our rescues. From the hearts of those who were saved and placed on the road to freedom…thank you for all you do! We could NOT do this without each and every one of our fosters, adopters, volunteers and supporters. We hope you enjoy a look at this very special ‘Independence Day’ for our adoptables and our rescue. Happy Fourth of July sweet friends and family. Waiting for Evanston Fourth of July 2013 Parade to begin. Places everybody!! Our fosters, adopters, volunteers joined Wagging Hearts for the Parade walk to showcase our rescues. Sharpie, available for adoption, sitting in his puppy pen waiting for the parade to begin. Raffles, available for adoption, and his foster sister in Fourth of July attire!! Wagging Hearts in full effect! Our puppies eager to begin this ride of freedom. Puppies aplenty’ weaving in and out of our young volunteers legs as they sit in one of the puppy pens atop the float. Kirsten carrying one of the smallest pups looking for furever love! Foxy, available for adoption, sitting in his foster momma’s arms. Safe untill a forever family comes calling!! Nick giving the all-clear, all-good thumbs up as the procession begins to move. More precious pups sitting atop the float decked out in Patriot flaire. One of our rescue pups letting everyone see what a second chance looks like. Napping in the shade while the parade steps up in energy and motion all around. A Wagging Hearts pup riding atop the float looking to connect with that special someone in need of someone to light their world on fire with happiness and joy. Everyone deserves a break!! Looking cute is tough work. Raffles laying low after looking cute as a button with his foster sister. Wagging Hearts adoptables all dressed up and waiting to show off their Independence flaire. Cookie, available for adoption, looking beautiful and soulful while trying hard not to look like she is waiting for her forever family to find her. She will make someone a wonderful companion, one only needs to look deeply into those gorgeous eyes of hers. Ashely, available for adoption, wiggled her Patriotic ribbons hoping someone would notice her and want to make her a permanent addition to their family. Another fashion beauty waiting to strut their stuff. Cookie, available for adoption, looking like she knows something big is about to start. Perhaps forever love!! Sweet adoption success!! A Wagging Hearts alumnist out to show support for the furfosters still in need of permanent homes. Wrigley, available for adoption, could not of drawn more attention with his great walk, handsome face and eager disposition. Wrigley, available for adoption, ready with a smile and a chance hope that forever love will find him. Belle, Wagging Hearts mascot, checking out the streets to insure her furbabies will be clear for takeoff. The Wagging Hearts float with volunteers and fur babies waiting patiently. Wagging Hearts float at the Evanston Fourth of July Parade, 2013. Luke with one of our smallest pups laying low in a wagon built for two. Another Wagging Hearts pup looking for forever love. Can you imagine the puppy kisses you would receive!! Luke and pup, adventures untold! Chino, available for adoption, with his foster sister. Chino, available for adoption, could not be cuddlier or cuter with ears that could wrap you in his love. Chino, available for adoption, looking for a forever home. Who wouldn’t want to greet each day with this face eager to bestow love and kisses. A smiling pup looking for furever love. Wrigley on far right, available for adoption, meeting and greeting some younger pups new to the Wagging Hearts scene. Wrigley (far right) being kissed by Chino (middle) and Ashley (far left), all of whom are available for adoption. Another Wagging Hearts volunteer wearing the proper festive attire and ready to go. Could the cuteness factor being any higher!?!? Everyone prepping for the big walk. Shhhh, squeezing in a quick nap in the lap of young, volunteer love. Sassy (available for adoption) sitting so pretty and precious. Her lack of sight does not dimensh her zest for life or her ability to let the world swirl all around her. She is amazing. Ashley looking very patriotic in her appearal. This is a moment that will be imprinted on this young volunteers life and I hope she remembers the lives she helped share in hopes that they each find forever love. What an impact she is making and she doesn’t even know it..
Wiggles (available for adoption) walking with his foster momma; along with another new Wagging Hearts young pup being carried in the arms of volunteer tenderness. Walking the walk of freedom…it never looked so good! Luke and his foster pup sitting back and enjoying the ride. A sea of Wagging Hearts green, walking one-by-one with the lives that have been saved. What a beautiful sight – volunteers, fosters and adopters walking for the lives that now have freedom. Sly on the right (available for adoption) overwhelmed but courageous on the float. He is a soul looking for tender, patient, dedicated love. The Wagging Hearts Puppy Palace Parade float. Adopted dogs came out to mingle and walk in support of their rescued friends. The youngest Wagging Hearts volunteers sat in the puppy pens to take care of the youngest rescues. We walked. We talked. We handed out tattoos. We asked for support. Wishing all our supporters a happy Fourth of July from all of us!! Oh how the public loved our rescues. Many flocked to the streets to touch. Cuddle or croon to one of our babies. Sharpie, available for adoption, sitting on top of the world so he can glimpse forever love when it comes. Diamond, a Wagging Hearts alumnist. Saved and adopted from Wagging Hearts. Another Wagging Hearts alumnists, saved and adopted. Walking the walk of freedom. Sweet Cookie, available for adoption, with her expressive eyes. Her gentle ways. What a joy should would bring YOUR way. Cookie, looking for forever love. Send in an adoption application today! Cookie is waiting to shine her light your way. Beautiful, happy and ready for forever love. Beauty, another Wagging Hearts mascots. In the arms of her family. Safe and sound she will always be. Wagging Hearts wrapping up the parade with a big THUMB’s UP on a fantastic event!! Chino, available for adoption, tuckered out from a big day of fun in the sun looking for furever love. Stop by to meet one of our outstanding adoptables today, June 22 from 11-4 PM and tomorrow, June 23 from 11-3 PM at the Petco in Round Lake Beach, IL. We will be bringing a number of our dogs and cats available for adoption. We hope to see you there so you can experience all the unique personalities, shapes and sizes that are looking for a forever home exploding with some beautiful furever love. They have so much to share and are waiting patiently for you to find them. Their dedicated love is a true gift for the heart and soul. If your life is missing laughter, joy and happiness…then you might just be looking for a Wagging Hearts adoptable this weekend! Fill out an adoption application in advance!! Start the process early so all that is needed is to sweep your new love up in your arms and start your new life together. Don’t forget to bring your furbaby to take advantage of Petco’s Photos for Patriots event today. An early bird celebration of the Fourth of July with professional photographs for your pet. All proceeds will be graciously donated to Wagging Hearts in support of our mission and animals. We could not ask for a better partner in rescuing lives than with the Petco staff and management at the Round Lake Beach store location. Try them out the next time you are in need of a couple items for your companion pets, they are waiting to assist you with a smile! Hope to see you there and spread the word!! Otis was saved from a high-kill shelter in Chicago, IL just as his time was up. Just a mere 9-months old when Wagging Hearts discovered his dire plight and pulled him to safety. Otis was among the hundreds tucked away behind ‘Rescue-Only’ doors. Unavailable to the public unless a rescue organization became involved in time to save their life. Hours mean the difference between life and death. Otis was saved not only from the clock but also found to be very ill upon closer examination. He was rushed to the vet with pneumonia where he was monitored 24-hours a day while being nursed back to health. Otis is currently healed and his spirit continues to blossom. Otis is a pittie mix who is now healthy and growing by leaps and bounds at a young age of 11-months. A heart filled with sweetness. Great with other dogs and ready to be a part of a solid forever family. Otis was being fostered (with another Wagging Heart rescue pittie) by a wonderful family who was relocated out-of-state. So once more Otis will need another place to rest his head. His short life has been a series of transitions and his young puppy heart wants yearns for someone to love. And for once in his life…to find someone to love him unconditionally, consistently and diligently. Fill out an application for Otis if he strikes your fancy and offer to foster, foster-to-adopt, or maybe just jump right into forever love and adopt Otis right away. He is patiently waiting for someone to see just how special he is, don’t make Otis wait any longer. Act now and take him into your home today!! Forever Homes Wrapped in Furever Love. The Impact of Forever Homes … is just immense. We could not do this without the support of our foster homes who provide love and care wrapped in a comfortable setting. Our animals experience positive nurturing, socialization and attention in their foster homes so they are ready and able to connect with furever love when it comes their way. Such as in the cases of Noodles, Casey Lane, Kiera, Max and Walter. All of these animals were rescued by Wagging Hearts when time was not on their side. Fading away into darkness and now because of four adopters and their families…they are thrust back into the light. This is what it is all about and with the continued support of our foster families and the community of animal lovers seeking to provide a rescue animal with a permanent home. This chain is delicate and could not be achieved without each crucial part acting as one; RESCUE to FOSTER to ADOPTION to FUREVER LOVE. Please share the powerful impact of adopting a rescue animal with family and friends. Let’s hope they have an opportunity to become a part of this delicate chain of life-saving events. Thank you for being a part of their forever. We are grateful that you saw these beautiful spirits and acted on a desire to provide a forever home wrapped in furever love. Consider changing the life of a rescue animal by providing some furever love today. Please take a moment to look at the animals of Wagging Hearts who are in need of permanent homes that they can fill with their love, joy and kisses. Find a face you connect with and fill out an adoption application to start the process. Don’t delay, visit our adoptables section so you can make that life-changing connection now.